The Bush administration is coming under growing domestic pressure over its Iraq strategy amid continuing attacks on US forces in the country. The US Senate has voted unanimously to urge President George W Bush to consider asking Nato and the United Nations for help in rebuilding Iraq. The non-binding resolution said that while it was in the interests of the United States to remain engaged in Iraq, conditions there posed a serious threat to American troops. Public opinion in the US appears to reflect this disquiet, with polls showing a marked decline in support for the Bush administration's policy on Iraq. The Senate vote came after General Tommy Franks, until recently at the helm of US-led coalition forces in Iraq, warned that American forces might have to remain in the country far longer than anticipated. General Franks said attacks on US soldiers, which have killed more than 30 since the war was declared over, were occurring at a rate of 10 to 25 a day. Friday saw the US pull most of its troops out of a police station in the Iraqi town of Falluja, about 50 kilometres (30 miles) west of the capital Baghdad, a day after protests at the continued US military presence there. 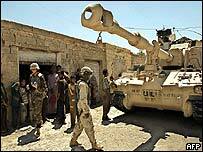 An American military spokesman said about six soldiers would remain at the station to support the new police force in the town, where there have been frequent clashes between Iraqis and US forces. Iraqi police officers had threatened to resign if the Americans did not leave the station, as they felt joint patrols with American forces placed them at risk of attack. Overnight, a series of three mortar strikes were launched on an American base in the town of Ramadi, 100 kilometres (60 miles) west of Baghdad, although there were no injuries reported. And the US military said two Iraqi civilians were wounded in crossfire following a rocket-propelled grenade attack on a US patrol near Baghdad airport. Senators from the opposition Democratic Party - many of whom supported the decision to launch the war in Iraq that toppled Saddam Hussein's regime - are expressing deep concern about events on the ground. They are also raising questions about the administration's citing of Iraq's alleged weapons of mass destruction as a justification for the decision to go to war. No such weapons have been found in Iraq. The Democrats urged Mr Bush to mend fences with France and Germany - key Nato members who were firmly opposed to the war. Senator John Kerry, who hopes to challenge Mr Bush for the presidency next year, said: "We now know that the administration went to war without a thorough plan to win the peace. "It is time to face that truth and change course, to share the post-war burden internationally for the sake of our country." Senator Carl Levin, leading Democrat on the Senate Intelligence Committee, said it was "a mystery" why the Bush administration had not made a formal request for Nato forces in Iraq. He expressed the hope that soldiers wearing Nato insignia would not be targeted in Iraq with the same ferocity as their American counterparts. But there appears to be a marked reluctance among other nations to commit troops to support US and British forces in Iraq. Secretary of State Colin Powell admitted there was uncertainty about the level of support the US and Britain could expect. "I can't give you the exact number of nations or how many troops are going to be committed," he told CNN. "The guts of the work will still have to be done by the United States, Great Britain and the original members of the coalition." There is also concern about the cost of the US commitment to Iraq. The Senate warned that the final bill for reconstruction would run into tens of billions of dollars over several years, and projected that Iraqi oil revenues will not cover those costs. Defence Secretary Donald Rumsfeld has said that the cost of continuing military operations in Iraq is running at $3.9bn a month, higher than anticipated. "The Americans are becoming increasingly wary"